What Happened To Joseph, The Father Of Jesus, In The Bible? Does the Bible hold any clues as to what happened to Joseph, the father of Jesus? Jesus had no earthly father but a heavenly Father, Who is God and so only Mary, Jesus’ birthmother is His actual parent, although Joseph, to his credit, took the pregnant Mary as his wife and did not divorce her as he could have easily done. We don’t know a lot about Joseph. From the biblical account of Jesus’ birth, we know that he must have understood that Jesus was unique to human history. Joseph and Mary apparently were observant Jews as we read in Luke 2:22-24 where it says “And when the time came for their purification according to the Law of Moses, they brought him up to Jerusalem to present him to the Lord (as it is written in the Law of the Lord, “Every male who first opens the womb shall be called holy to the Lord”) and to offer a sacrifice according to what is said in the Law of the Lord, “a pair of turtledoves, or two young pigeons.” There they met “Simeon, and this man was righteous and devout, waiting for the consolation of Israel, and the Holy Spirit was upon him” (Luke 2:25) and saw in Jesus that God had “prepared in the presence of all peoples, a light for revelation to the Gentiles, and for glory to your people Israel” (Luke 2:31) and so Joseph “and his mother marveled at what was said about him” (Luke 2:33) so surely Joseph knew that Jesus was more than just a child. He was the Word of God that came to dwell among us, coming in the flesh as it says “the Word became flesh and dwelt among us, and we have seen his glory, glory as of the only Son from the Father, full of grace and truth” (John 1:14). We know that Joseph was still around when Jesus was a young boy of twelve and being Jews, they observed the holy days and so they went up to the feast but “when the feast was ended, as they were returning, the boy Jesus stayed behind in Jerusalem. His parents did not know it, but supposing him to be in the group they went a day’s journey, but then they began to search for him among their relatives and acquaintances, and when they did not find him, they returned to Jerusalem, searching for him” (Luke 2:43-45) and “After three days they found him in the temple, sitting among the teachers, listening to them and asking them questions. And all who heard him were amazed at his understanding and his answers” (Luke 2:46-47). Finally, “when his parents saw him, they were astonished. And his mother said to him, ‘Son, why have you treated us so? Behold, your father and I have been searching for you in great distress.’ And he said to them, ‘Why were you looking for me? Did you not know that I must be in my Father’s house’” (Luke 2:48-49), however “they did not understand the saying that he spoke to them. And he went down with them and came to Nazareth and was submissive to them. And his mother treasured up all these things in her heart” (Luke 2:50-51). This would come back to Mary much later in Jesus’ life but by that time, Joseph would be gone, as in having passed away. How he passed away and for what reason, we simply don’t know because the Bible is silent on this and so we must be silent too. We can assume that Joseph, being a Jew, must have taught Jesus as a youth in the ways of God and likely from Scripture. When Joseph found out that Mary was with child (Jesus), he could have divorced her and made her a public spectacle but that’s not what Joseph did. He was not willing to put her to public shame and so he planned to secretly divorce her to protect her from a public scandal that would have gotten both of them kicked out of the temple (Matt 1:19). Joseph was apparently a man of integrity but before he began the secret divorce procedure, “an angel of the Lord appeared to him in a dream, saying, “Joseph, son of David, do not fear to take Mary as your wife, for that which is conceived in her is from the Holy Spirit. She will bear a son, and you shall call his name Jesus, for he will save his people from their sins” (Matt 1:20-21) and so “When Joseph woke from sleep, he did as the angel of the Lord commanded him: he took his wife, but knew her not until she had given birth to a son. And he called his name Jesus” (Matt 1:24-25). This tells us a lot about Joseph’s heart and his compassion so there is no doubt that he was living a life that was pleasing to God but what happened to Joseph? Why did he disappear from the pages of Scripture? I don’t think it’s as important to know why Joseph died or how but that he raised Jesus in the Jewish faith of his day, faithfully keeping the commandments as best that he could and observing the Mosaic Laws and keeping the feast or holy days. In the very last reference about Joseph, found in Luke, we know that he was a devout follower of the customs of his religion which we can see with his observance of Passover. Naturally, Joseph would have made certain that Jesus received the proper spiritual training but we also know that Joseph was around long enough to have more children through Mary and that Jesus was the firstborn in that family and the eldest brother. Perhaps Joseph had died after Mary and his children had reached adulthood. We just don’t know. Church history and biblical accounts can only give us things to speculate on and that’s not a safe place to reach an absolute conclusion. The fact that Joseph disappeared from the pages of Scripture very early doesn’t sway our beliefs on the integrity of this family. 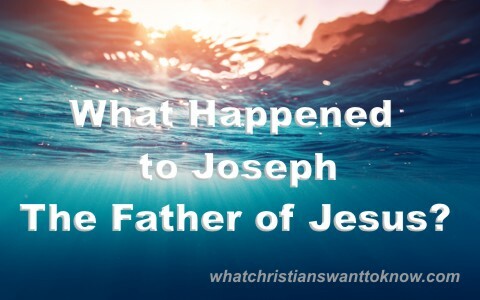 No doubt they had a godly upbringing but someday we will know what happened to Joseph so our only conclusion is that if God saw fit to keep Joseph’s death quiet and the reasons for it, we have no business trying to guess where the Scriptures are silent. The philosophy of where the Bible is silent, so must we be and this is perfectly appropriate for the question of what happened to Joseph, the father of Jesus, because we simply do not know. Could Joseph possibly have rejected Jesus ? His brothers and sisters did. He wasn’t at the crucifixion nor was any of his family except Mary. Hello Mike. There is no way that Joseph would have rejected Jesus. He was a godly man (read the early times of Joseph and Mary) and was in the royal lineage of Jesus Christ, and his brothers and sisters and all the other disciples except some woman and John all forsook Him at the cross. Joseph apparently died early, perhaps in Jesus’ teen years. Next post: What Was The Significance With The 30 (Thirty) Pieces Of Silver In The Bible?